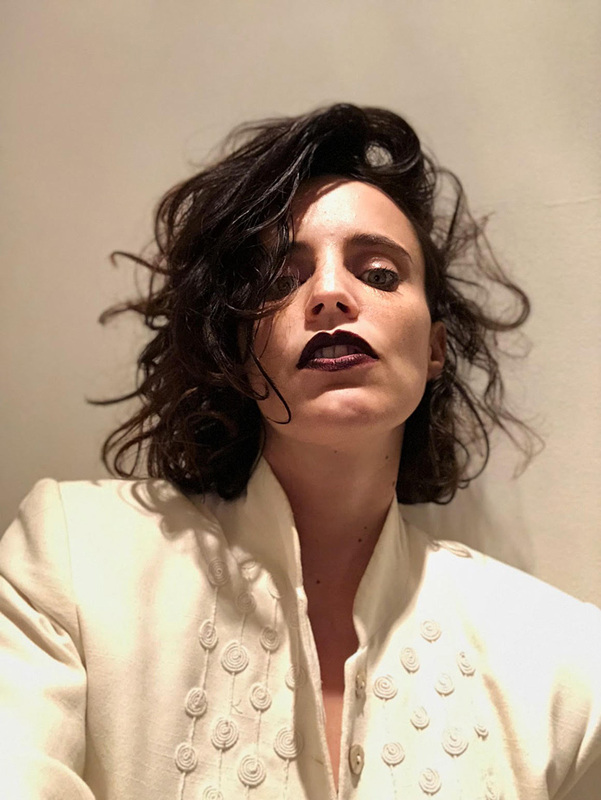 We asked Anna Calvi to take a self-portrait. We also asked her to write a list of personal things—interesting facts that fans may perhaps not know about her. The singer/songwriter/guitarist was born in Twickenham, a suburban area southwest of central London, to a British mother and an Italian father, both therapists. Calvi took to music early, learning guitar at age eight, although it took her until her mid-20s before she overcame her fear of singing in public. Brian Eno was an early supporter, telling BBC 6 Music in 2010 that she was "the best thing since Patti Smith." Calvi's 2011-released self-titled debut and 2013's sophomore album One Breath were both nominated for the prestigious Mercury Prize. Now five years later she has returned with her long-awaited third album, Hunter. It's equally as lush and passionate as her first two. Nick Launay (Nick Cave) produced Hunter and it features Adrian Utley from Portishead and Martyn Casey from The Bad Seeds, among others. Thematically, Hunter deals with gender. "I want to go beyond gender," said Calvi in a statement announcing the album. "I don't want to have to chose between the male and female in me. I'm fighting against feeling an outsider and trying to find a place that feels like home." The album's first single, "Don't Beat the Girl Out of My Boy," tackles how children at a young age are conditioned to conform to gender stereotypes, particularly how small boys are taught not to cry or express emotions. Read on as Calvi discusses her family history, a childhood imaginary friend, how she met her girlfriend, and more. 1. I'm obsessed with circles. I look for them everywhere. If I see a circle I can't focus on anything else. I've made many paintings of circles and whilst I wrote my last album I also constructed a huge sculpture made out of many intertwined circles. Whenever I got frustrated or lost with a song I would work on my sculpture and it helped me enormously. 2. I love learning about my family history. My Italian grandfather went on a hunger strike when my grandmother's family wouldn't let them marry as they were too young. I've learnt a lot about love and devotion from my Italian family. They are very romantic. Although I don't think I could go on a hunger strike for anyone. 3. When I was a kid I used to imagine I had a big brother called Michael. I had many imaginary games with him, he followed me everywhere. I later realized that he was probably a projection of who I wished I could be, as I never liked being a girl when I was young. I identified much more as a little boy. 4. I read incredibly fast. I can read a book in two days, but I'm not particularly proud of it. I'm sure I'm not taking in as many details as I could. I'm trying to force myself to read slower. 5. I was born without a proper hip socket. I was in a lot of pain, which was hard. However I do Pilates and I've got so much stronger than I've ever been before, and the pain has gone. Part of why my new record is about freedom is because I wanted to go beyond the limitations of my body. Now that I have more strength I feel so much freer with my body onstage. I feel like a new person, it's very liberating. 6. I met my girlfriend at one of my shows. She's from France and I moved to Strasbourg for a year to be with her. We lived in a beautiful flat with two little balconies. It was a really perfect time. I wrote most of the record in our flat, and I would play my girlfriend everything I wrote when she got back from work every day. Anna is great songwriter and musican. I often listen her songs.